Cruising the Dalmatian Coast: from Šibenik to Zadar offers an astonishing historical and cultural tour of one of Croatia’s most diverse coastal regions, an area rich in verdant landscapes and sparkling seascapes, delicious local culinary delights and breathtaking architecture. This is a very different experience, a cruise offering a quieter, more intimate and more off-the-beaten-track take on Dalmatia and its wonderful cuisine, all in the company of one of our expert guides. The cruise features a wealth of unique natural vistas. From Šibenik’s towers, the view opens upon a forested coastline mirrored by serried tiers of islands, seemingly stretching beyond the horizon. In the Krka Valley, a river has spent eons eating its way through horizontal layers of limestone, forming a series of great waterfalls: an astonishing sight. The same can be said for the Kornati archipelago, a surreal panorama of countless tiny rock islets piercing through the shimmering surface of the Adriatic. Quieter and less frequented than the south, the region offers a dazzling mosaic of cultural and historical attractions. Beautiful Šibenik is graced with a truly magnificent cathedral and a trio of mighty fortresses. Zadar’s Venetian walls protect a most unusual heritage of Eastern and Western architectures as well as one of the most outstanding collections of ancient glass in Europe. In Nin, a tiny island hosts one of Croatia’s medieval capitals, its belfries dreaming away in serene dignity. Magnificent Trogir offers a near-fully preserved medieval cityscape, recognised by UNESCO as a World Heritage site. Cruising the Dalmatian Coast: from Šibenik to Zadar brings you to all these experiences in style and comfort, aboard a beautiful Turkish-built gulet, approaching the islands, coast and towns on the glittering Adriatic. Our team of expert guides will breathe life and meaning into the area’s history and the boat’s crew will make sure that your trip is memorable and idyllic from beginning to end, not least through their delicious offerings of Croatian cuisine, complemented by meals in selected restaurants ashore. Average rating 5 out of 5 from 372 reviews for Cruising the Dalmatian Coast: from Šibenik to Zadar, according to AITO reviews. Day 1: Arrivals. Your gulet awaits you in historical Šibenik, about an hour from Split airport. Welcome drinks and dinner on board. Day 2: In the morning, we enter the vast estuary of the river Krka, mooring at the beautiful riverside town of Skradin. From there, we set out for the historic citadel of Bribir, ancient Varvaria, where a mighty Roman fortification wall surrounds the remains of many eras, including the early Middle Ages, when Bribir became a centre of nascent Croatia. Later, we admire the magnificent waterfalls near Skradin, before cruising through the Šibenik archipelago for a delightful swim and a quiet bay. Day 3: In the morning, we visit the delightful little archaeological museum in the seaside town of Biograd na Moru. Its exhibits include parts of the extraordinary cargo of the Gnalić shipwreck, discovered only a few miles away. This Renaissance merchant ship, named Gagiana, sank in 1583 on a voyage from Venice to Constantinople, the cultural beacons of the era, carrying an unbelievably rich cargo of manufactured goods from all over Europe. We then cruise to Zadar, ancient Iader and Venetian Zara, a city where history abounds. We explore the Venetian fortifications, Roman walls, fascinating church of St. Donatus with its strong Byzantine and Carolingian influences and the excellent archaeological museum. Day 4: In the morning, we visit the incredibly beautiful museum of ancient glass at Zadar, witnessing a presentation of the millennia old art of glass-blowing. We then head inland on an excursion to Nin, one of Croatia’s first medieval capitals, set on a tiny island in a serene lagoon. The local archaeological museum sets the scene for a place of immense historic depth. In the afternoon, we cruise out to a cove on one of the neighbouring islands. Day 5: We cruise out to the fabled Kornati Islands, a fairytale scattering of innumerable rock islets set in one of the most striking maritime landscapes in the entire Mediterranean. In this National Park of crystal clear waters, glorious swim spots abound. Conditions permitting, we visit Tureta, a Byzantine beacon fortress forming part of a long string of such sites along the Dalmatian shore. Day 6: A morning cruise south through island clusters to explore the impressive and beautiful city of Šibenik, with its crooked lanes, quaint squares and superb cathedral, a masterpiece bridging the Gothic and Renaissance styles, now a UNESCO World Heritage site. High above are grand medieval fortresses, built to secure this valuable and strategic town, which offer vast and epic views out to sea. The city’s archaeological museum is one of the best in Croatia. Day 7: We cruise along the beautiful shores of Šibenik County, passing by countless islands, before finally making our way to Trogir. The medieval city, set on a little island, preserves its Romanesque and Gothic streetscape nearly completely. We explore its labyrinthine lanes, delightful piazzas, charming sea front and the cathedral of St. Lawrence with its magnificent portal, one of the finest works of Romanesque Art in Europe. Farewell dinner on board. 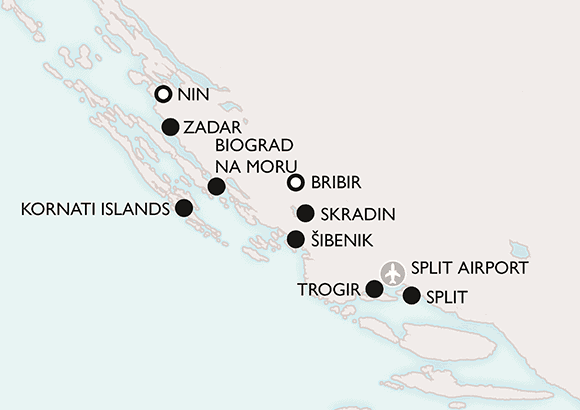 Day 8: Departures from Marina Baotić to Split airport, about 20 minutes away. Day 1: Our gulet is about 15 minutes from Split Airport at Marina Baotić near Trogir. Welcome drinks and dinner on board. Day 2: We explore Trogir. The medieval city, set on a little island, preserves its Romanesque and Gothic streetscape nearly completely. We explore its labyrinthine lanes, delightful piazzas, charming sea front and the cathedral of St. Lawrence with its magnificent portal, one of the finest works of Romanesque Art in Europe. We then cruise west with a chance to swim in the azure waters of the Adriatic. Day 3: In the morning, we enter the vast estuary of the river Krka, mooring at the beautiful riverside town of Skradin. From there, we set out for the historic citadel of Bribir, ancient Varvaria, where a mighty Roman fortification wall surrounds the remains of many eras, including the early Middle Ages, when Bribir became a centre of nascent Croatia. Later, we admire the magnificent waterfalls near Skradin, before cruising through the Šibenik archipelago for a delightful swim and a quiet bay. Day 4: In the morning, we visit the delightful little archaeological museum in the seaside town of Biograd na Moru. Its exhibits include parts of the extraordinary cargo of the Gnalić shipwreck, discovered only a few miles away. This Renaissance merchant ship, named Gagiana, sank in 1583 on a voyage from Venice to Constantinople, the cultural beacons of the era, carrying an unbelievably rich cargo of manufactured goods from all over Europe. We then cruise to Zadar, ancient Iader and Venetian Zara, a city where history abounds. We explore the Venetian fortifications, Roman walls, fascinating church of St. Donatus with its strong Byzantine and Carolingian influences and the excellent archaeological museum. Day 5: After breakfast we visit the incredibly beautiful museum of ancient glass at Zadar, witnessing a presentation of the millennia old art of glass-blowing. We then head inland on an excursion to Nin, one of Croatia’s first medieval capitals, set on a tiny island in a serene lagoon. The local archaeological museum sets the scene for a place of immense historic depth. In the afternoon, we cruise out to a cove on one of the neighbouring islands. Day 6: We cruise out to the fabled Kornati Islands, a fairytale scattering of innumerable rock islets set in one of the most striking maritime landscapes in the entire Mediterranean. In this National Park of crystal clear waters, glorious swim spots abound. Conditions permitting, we visit Tureta, a Byzantine beacon fortress forming part of a long string of such sites along the Dalmatian shore. Day 7: A morning cruise south through island clusters to explore the impressive and beautiful city of Šibenik, with its crooked lanes, quaint squares and superb cathedral, a masterpiece bridging the Gothic and Renaissance styles, now a UNESCO World Heritage site. High above are grand medieval fortresses, built to secure this valuable and strategic town, which offer vast and epic views out to sea. The city’s archaeological museum is one of the best in Croatia. Farewell dinner on board. Day 8: Departures from Šibenik to Split airport, about an hour away. We plan for the gulet to leave Šibenik (approx. 1 hour from Split Airport) after 17:00. Embarkation is from 15:30 onwards. If you arrive at the gulet after 17:00, we will do our best to enable you to join the tour at a convenient time and place. Departure time can be subject to change depending on weather, harbour or other conditions. Disembarkation in Marina Baotić near Trogir (approx. 20 minutes from Split Airport) is around 09:00. We will arrange local transfers from Split airport and to Split airport on the first and last day of the tour. We plan for the gulet to leave Marina Baotić near Trogir (approx. 20 minutes from Split Airport) after 17:00. Embarkation is from 15:30 onwards. If you arrive at the gulet after 17:00, we will do our best to enable you to join the tour at a convenient time and place. Departure time can be subject to change depending on weather, harbour or other conditions. Disembarkation in Šibenik (approx. 1 hour from Split Airport) is around 09:00. We will arrange local transfers from Split airport and to Split airport on the first and last day of the tour.